Roger Dahl is an American cartoonist who has lived and worked in Japan. He has a book titled “Comic Japan: Best of Zero Gravity Cartoons from The Japan Times-The Lighter Side of Tokyo Life” which is a collection of his comics about life in Tokyo for an American couple. (Click here to read my review and to enter (by 2015 March 22nd) for a chance to win a free copy of his book). Roger Dahl has kindly agreed to do an interview with me. – My questions and comments are in red. Roger Dahl’s answers are in black. 1. Could you please give us a short self-introduction? I was born in Tacoma, Washington, not far from Seattle where I now live (in the North Beach area of Ballard). I graduated from two universities: The University of Puget Sound, where I got a degree in Art, and from the University of Washington’s School of Medicine. My medical specialty was in Prosthetics and Orthotics – making artificial limbs and braces for patients. I worked briefly for a hospital in the Washington, DC area, but decided I just didn’t love being stuck mostly in a lab all day (I DID very much enjoy interacting with patients). I often tell people that my medical training made me a better artist; all those courses in anatomy have helped me make my cartoon characters anatomically correct. 2. How / when did you first become interested in Japan? My aunt and uncle were missionaries in Japan for many years, so I became familiar with the culture from an early age. I didn’t really get interested in visiting until my sister went there and had a blast. A few years later I visited for four months, staying in the home of a professor at Tokyo University. It was a great introduction to Japan, and I have loved the country ever since. Interesting trivia: My relatives had a cabin in the mountain resort of Karuizawa (one of my favorite places in Japan). John Lennon and Yoko Ono lived there for a time when Sean was young. Lennon occasionally would attend chapel services, so my uncle met him. Since then, I have met others missionaries who hung out with the Lennons. All say that they were extremely pleasant. 3. You lived in Japan from 1991 until 1995, didn’t you? Have you been back to visit Japan since ’95? How do you continue to draw comics about Japan? Actually, I moved to Japan as a resident in 1989. I was hired in Seattle by a representative of a Tokyo conversation school. It was a miracle that they hired me, as I had no teaching experience, and was competing with candidates who had strong credentials. It turned out that teaching was an excellent fit for me, and I loved the job. Over the Christmas/New Year’s holiday break of 1990/91, I committed to creating a comic strip about Japan, as I found the culture so amusing and wasn’t seeing any such satire in any of the national English daily newspapers. I came up with about a dozen comic strips which became Zero Gravity. I was told by a seasoned journalist that I would have no chance of getting hired by any of the big papers, but I forged ahead anyway. Two of them offered me jobs, and I went for The Japan Times because it was the biggest, most independent and prestigious, and simply felt like the best fit for me. The editors there told me that what interested them most was the one political cartoon I added just to demonstrate versatility. So that hiring was in February 1991. I was then living in Naka-Meguro, Tokyo. At the same time of my Japan Times hiring, I was also offered a job to teach at a private boys senior/junior high school (Zushi Kaisei) in Zushi, just south of Kamakura, in the suburbs of Tokyo and Yokohama. I taught there for four years while also producing my political cartoons and comic strips. It was really challenging juggling these job demands, but I’m glad I did this, as a lot of the material for the comic strip came from my experiences living in Zushi. Because it is so close to Tokyo, I still spent lots of time in the megalopolis, which I never grew weary of. When I decided I needed to return to the States (especially because my father’s health was declining), my Japan Times editor graciously asked me if I’d like to continue cartooning from abroad. I actually never dreamed it would become a long-term arrangement, but here I am in my 25th year. Having the resources of the internet has made all of this possible. I feel like I manage to keep abreast of the cultural and political zeitgeist of Japan sufficiently to continue commenting as I’ve been doing. I didn’t have the internet while in Japan, so in some ways I feel better informed now, even though I’m not in-country. It helps that I maintain so many friends – both Japanese and expatriates – in Japan. 4. I came to Japan in 1990 (around the same time as you)…a lot has changed in Japan in the past quarter-century. What are some of the good changes you’ve noticed? Some of the not-so-good? I think a lot of the pressure to conform has diminished. I tend not to be very conventional in my thinking, so I consider this shift progress. I do somewhat regret, however, that some charming traditions might be lost as Japan forges ahead in its postmodern development. The global phenomena of obsession with electronic devices seems to be one relatively recent change in Japanese society that I’m suspicious of, as it seems to separate people more than it connects them. Of course, I’m just as guilty of this as anyone in Japan. 5. What brought you to Japan initially? As I mentioned previously, it was initially the awareness of the country through the stories of my aunt, uncle and cousins. Also, as an artist, I think I was always drawn to the aesthetics of Japan. My ancestors came from Scandinavia, Sweden, Norway and Denmark – and I’m only a generation removed from that region of Europe. I have often reflected that the Japanese are the Scandinavians of Asia, sharing many traits, such as minimalist aesthetic traditions, love of refined craftsmanship, healthful lifestyles, personality reserve, etc. 6. What did you do for employment at first? How did you get a job with the Japan Times newspaper? I guess I kind of answered that already with my account of preparing strips for submitting to the national English dailies. I’m a big advocate of boldly attempting the seeming impossible. That was why I was willing to go to Japan to teach. I was slightly terrified of teaching, but found out that it came fairly naturally to me. Submitting strips to big newspapers took some moxie too. My initial interview with The Japan Times left me with some doubts, as the managing editor wondered if I’d be able to find sufficient material for a regular feature. A big change came when JT started asking for three cartoons a week instead of two. That was a really difficult challenge. 7. What do you think Japan should learn from American culture? And vice-versa? I’m discovering that culture has really become globalized, and that everyone is influencing everybody else now. I think this is mostly a good thing. I think America has more to gain from being open to Japan, as Japan has always seemed more willing to adopt new things from abroad and make them its own. I think the US’s individualism is worthy of emulation, as is its positive emphasis on activism and altruism. I wish Americans could adopt Japan’s efficiency, attention to good service, and general considerateness; I really wish American cities could feel as safe as Japanese urban centers. I sure wish Japan would switch to driving on the right side of the road! 8. What advice would you give to newcomers to Japan? Try to become adept at doing things the way the locals do, but don’t be afraid to express your individuality. I would add that one should avoid having a critical attitude toward Japan when annoyances arise. I realize that must sound ironic coming from a satirist like myself, whose job often involves criticism. But in my day-to-day life in Japan, I was mostly going with the flow, and not making much of a fuss when frustrations arose. 9. What is a question that you’ve never been asked in an interview, but you think you should have been asked? And, of course, what’s the answer? How much of you and your experiences are in your ‘Zero Gravity’ characters and their experiences? A lot of the things that happen in the strip are based on the my own experiences or that of friends. However, many of their frustrations are not my own. I will add that the character of Larry in my comic strip is basically me. He looks a little like me (at least the way I looked twenty years ago!) and has my basic personality. 10. Any comments for the visitors to my blog? I noticed that some of your blog followers were asking about my possible relation to Roald Dahl. (It was asked here) He and I share a Norwegian heritage, but I have no knowledge of any common ancestry. Dahl is a relatively common name in all of Scandinavia, meaning “valley“. There are a lot of mountains and valleys in Norway! Also, in my family’s case, Dahl is a shortened version of the original name, which was, Ringdahl, I think. Since I started illustrating children’s books (I’m about to start on my third book with Penguin), questions about my relation to Roald Dahl have come up regularly. I certainly don’t mind speculation that I’m related to such an eminent creative person. The only drawback is that if I Google my name, links to Roald often come up instead. Thank you, Mr. Dahl for taking the time to answer my questions. Your answers are very interesting! Yesterday was a ‘metal’ day! Yesterday after work, my wife and daughters met me at Shibuya Station. They had bought a number of gifts for me! It came with two compilation CDs. 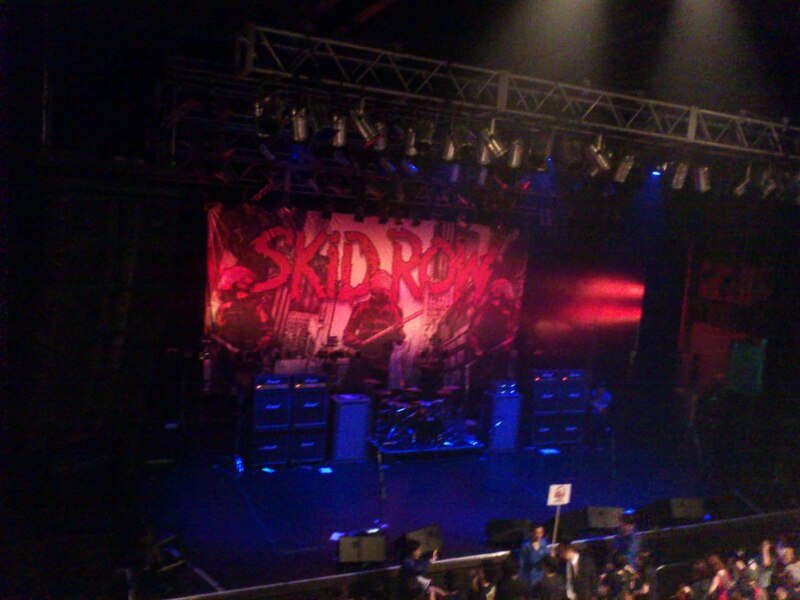 From there, we went to a ramen restaurant for dinner and then headed to the “O-East” club for the reason we were there…to see the Skid Row “United World Rebellion: Chapter One” concert! I did an interview with bassist Rachel Bolan last month about this concert, among other things. After that interview, the members of Skid Row kindly gave my family and I guest tickets to their Tokyo show that included special seating…and backstage passes to meet the band after the show! It was a great show! They played songs like “Let’s Go” and “Kings of Demolition” from their new album, as well as their classics such as “Slave To The Grind“, “18 And Life” , “I Remember You“, and of course “Youth Gone Wild” ! My wife had also bought a few 色紙 (Japanese paper boards) that are sometimes used for autographs, which the band signed for us. My wife, our daughters and I all had an excellent time and were treated like V.I.P.s by the members of Skid Row! Thank you Rachel Bolan, Scotti Hill, Dave “Snake” Sabo, Johnny Solinger and Rob Hammersmith! Do you know who Rachel Bolan is? He is the bass player of the excellent heavy-metal band Skid Row. Skid Row. Rachel Bolan is on far-right. Skid Row are scheduled to play a show in Tokyo on 2014 April 14th to promote their latest album “United World Rebellion: Chapter One“! This will be Skid Row‘s first visit to Japan since 1995. Nineteen years ago! Today, Rachel Bolan was kind enough to answer some questions from me for an interview! My questions are in red. Rachel Bolan‘s answers are in black. 1. Could you give us a self-introduction, please? Rachel Bolan, co-founder, bass player and song writer for Skid Row. 2. The new Skid Row release “United World Rebellion: Chapter One” is quite good. Will there be a “Chapter Two” ? Thank you. There will be 3 chapters in all. As a matter of fact, we just finished up recording “United World Rebellion – Chapter Two”. We are very excited about it! 3. What music / albums do you listen to most often these days? Lately I have been listening to an artist named Gin Wigmore. She’s great! I also listen to the music that I grew up with. 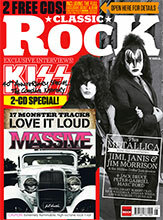 KISS, The Ramones, Aerosmith, Queen, etc. 4. Do you like Japanese food? Have you ever tried Tokyo’s original dish “Monja-yaki“? I love food in general, but Japanese is one of my favorites. Japanese meals always seem so well balanced. I haven’t had Monja-yaki, but would like to try it. I think every culture has a dish similar to it. My Uncle used to make something like it. It didn’t have dough in it however. Just egg as a binder. 5. Skid Row is scheduled to play a show at the O-East club in the Shibuya area of Tokyo, Japan. Could you give us a preview of what fans can expect at that show, set-list-wise and otherwise? We usually try to play something from every album. That gets more difficult as time goes on because our catalog keeps growing and I can’t see us playing a 4 hour show. Haha. We will play all the songs that you would expect us to play. Some new songs as well as some deep tracks. Lots of energy on stage because we love what we do! We may be getting older, but we haven’t slowed down a bit. チラシ (Flyer) for Skid Row’s upcoming show in Tokyo. 6. The last time Skid Row toured Japan was in 1995, wasn’t it? Why did it take so long for you to finally return? That’s right. Almost 20 years since our last visit. I have no idea why it’s taken so long. We’ve always had such an amazing time. I wish we were playing more than one show on this trip. We’ll make sure it doesn’t take another 20 years until we play there again. 7. How many times have you been to Tokyo? Are there any sites that you’re particularly looking forward to revisiting? Or some places in Tokyo that you haven’t seen yet that you would like to visit? I believe I’ve been to Tokyo 6 times. Also, Akihabara. I like to check out all the gadgets. I have never been to Tsukiji fish market. I’d really like to see it. 8. How do the fans in Japan compare to those in other countries? It’s funny. I’ve been asked that question by many journalists from many different countries. The answer is always the same. Skid Row fans are awesome in every country we go and very similar except for the language they speak. We have the most dedicated fans in the world. That’s why we called the trilogy ” United World Rebellion “. 9. Do you receive a lot of fan-mail from Japan? We do get quite a bit of email from Japan via Facebook and such. 10. Do you have a message for the fans in Japan? I just want everyone to know how excited we are to return to your incredible country. And how much we appreciate your unconditional support over the past 25 years. There’s not a night I step on stage that I don’t think how great a life that has been afforded to me because of fans like you. I mean that from the bottom of my heart! Thanks again to Rachel Bolan for taking time to answer my questions. These are great answers! Very interesting interview! I look forward to your show next month! Thanks also to Skid Row‘s webmaster, Noel Saabye to getting me in contact with Mr. Bolan. Have you ever heard of Holy Martyr? My great friend Masa told me about them. They are a heavy metal band from Italy. But their album titled “Invincible” is quite unique because the songs on that album are about famous Japanese samurai stories and battles! 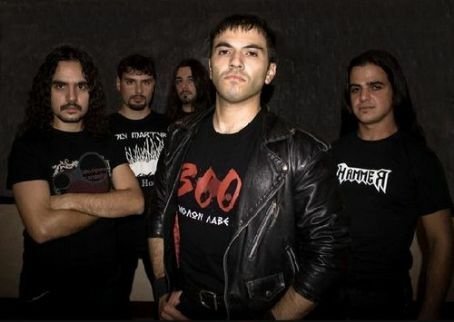 The guitarist of Holy Martyr, Ivano Spiga, did an interview with me. The interview is on my website’s “Interviews Page“…Click here to read it. Even if you’re not a fan of heavy metal, you should read the interview to learn why they decided to make a Japanese-themed album and also if it’s true that Italians use a spoon when they eat spaghetti, as many Japanese people believe. 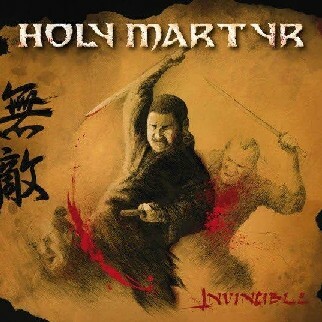 Of course, I also recommend that you check out the music of Holy Martyr. After you read the interview, come back to this page and leave a comment to let me know what you thought.